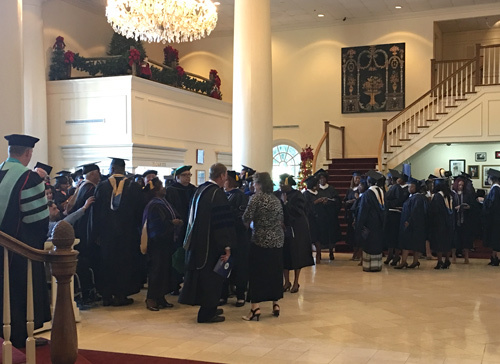 About 200 Webster University graduates from throughout South Carolina gathered for a joint commencement ceremony at the Carolina Opry in Myrtle Beach on Oct. 16. In addition to graduates from the Myrtle Beach campus location, members of the Class of 2016 who earned their degrees online or at other South Carolina locations including Greenville, Columbia, Charleston and Fort Stewart also attended with families and other guests. These grads included both master's degree recipients and those earning undergraduate degree completions. There was even a wife-husband duo of grads who were celebrating their MA in Human Resources Management and MA in Procurement and Acquisitions Management, respectively. ceremonies featuring grads fro across South Carolina and online. 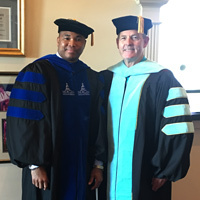 The commencement address was delivered by Robert Parrent, vice president for Enrollment Management & Student Affairs in St. Louis. New campus director Adriel Hilton welcomed students, faculty, colleagues and guests for the occasion.